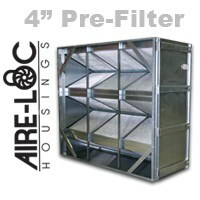 V-Bank Housing 4 Inch Pre-Filter | Air Filters, Inc.
Aire-Loc ™ V-Bank Housings are designed to hold a dual stage of filtration. 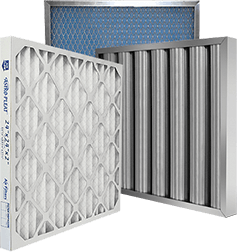 Intended for both new and replacement applications, each Housing accommodates a 4-Inch deep pre-filters and 30-Inch depth for V shaped filter arrangement to double the face area of filter media without increasing the footprint. Units are factory assembled in a "one-peice rugged construction", and reinforced with corner gussets to add extra stability.